A custom weapon in concept phase. Primary fire is a flamethrower. Secondary is a jetpack impulse. Enjoy a working prototype with a few bugs! As described in OP. Modders - I'd love a hand! I'm handing over my source files, which should go in /Content/the_hack/ (a few sounds or skins may not be present. Weapon mesh can be link). Zip attached. The main issue is the replication of the flame emitter. Works in 1p but 3p sees it stuck in the middle of the level (location/rotation/attachment not working i guess). I'm wondering whether the jetpack would be better as a pickup that you could use whatever weapons with. If it stays as a single weapon pickup, it would probably be a super weapon on a 1.5 or 2 minute timer like redeemer. And it would be designed for larger, more open multiplayer maps. We'll need a jetpack mesh, and perhaps the same mesh with a flame throwing hose out the front of the weaponised version. And I guess animations? I'm not into that side of it so those who are are welcome to take over! -main issue is that the flame emitter does not orient properly in 3p. I have included a hacky workaround in the prototype (a010), which gives you a correct 3p emitter but also a random one stuck int he middle of the map. - currently the jetpack rises really quickly. This is partially because of the way momentum is applied (respects player velocity), which makes it more realistic, but also because the player can still jump. I think ideally I'd like to remove jumping for player with the jetpack, or maybe limit the speed you can rise at. -flame sound not attenuated at the moment. Probably an easy fix. - since switching to a particle emitter for the flame, there are issue with collision. 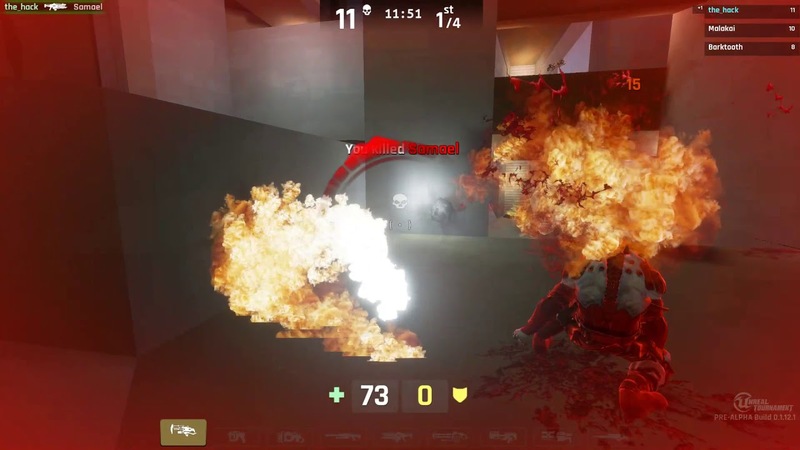 1st person flame collides with walls, 3rd person's doesnt. Has something to do with the hacky way it's setup. Last edited by the_hack; 07-31-2018, 01:58 AM. Updated utcc with a004. It all works but is super rough. I guess at this stage it's an idea to explore for more open gametypes. Flame doesn't shoot that far, you could use it in a single room. Secondary fire triggers boost. The boosting is a bit jittery/laggy. This is because I'm a noob at mutators and am still learning how to happen at all, let alone replicate smoothly. Basically I will now go read a much of stuff and prepare some sketches. If you ever want to try this out, easy way is to go to Shock and Rockets au hub, Testing tab, and Jetpack Flamethrower Wars. I personally prefer the jetpack to be as a pickup so it can be used as an alternative to the hoverboard for onslaught and maybe other gamemodes. Heres an old sketch of a jetpack i made in case its helps. Edit: Just wanna say that i love this community, freaking jetpacks man! Last edited by HereticGrunt; 07-29-2018, 01:07 PM. a005 sees a much nicer flame, based on a particle emitter (thanks to this tutorial ! :https://www.youtube.com/watch?v=tp0y_lWZcUQ). Looks and feels much nicer, but has collision issues as mentioned in OP.